DC Comics villains Poison Ivy and Harley Quinn aren't just a popular pairing of Batman villains, they're also a popular 'ship among fans. But now the comic publisher just mad that fan-fiction relationship became formal as a part of the official cannon. 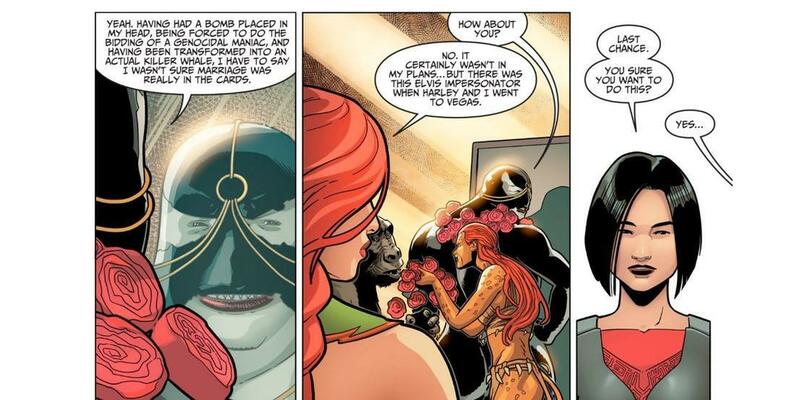 The Injustice comic book series already established that Harley and Ivy were a couple, but never suggested they were married before. But comic storytellers Tom Taylor and Bruno Redondo basically confirm that they've tied the knot here. Though the marriage takes place in a parallel universe, the two characters' romance also exists in the mainstream universe. The two entered into an open relationship in 2015, and they were always a popular pairing when they first started teaming up in Batman: The Animated Series. Unfortunately, the comic book series might have a happy ending for the pairing, but it doesn't last into the video game. Injustice 2 features both anti-heroes falling on opposite sides of the superhero conflict, and their romance comes to a bitter and violent end. But fans will get to see the characters pair up again when Harley Quinn gets her own animated series, coming to the DC Universe streaming platform. The recently released synopsis for Harley Quinn makes it clear that her best pal and girlfriend will play a prominent role in the upcoming cartoon. "Harley Quinn follows Harley’s adventures after she breaks up with the Joker and strikes out on her own in this new adult animated comedy. With the help of Poison Ivy and a ragtag crew of DC castoffs, Harley tries to earn a seat at the biggest table in villainy: the Legion of the Doom." Unfortunately, we don't know when the series will debut on DC Universe, as they only revealed that the streaming platform will be available later this year with the new live-action show Titans. Harley Quinn is said to debut sometime in 2019, alongside the revival of Young Justice. Injustice 2 #70 is now available on digital platforms.